Oh how I love a new polish launch from Picture Polish. And let me tell you I have been busting to share this one with you. 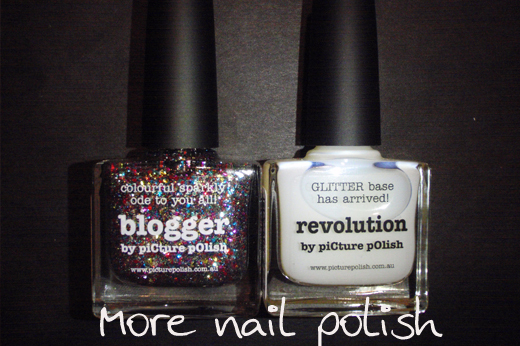 Today Picture Polish are adding two new polishes their line and together they form the blogger revolution. I love the play on words and the wonderful acknowledgement that the girls and Picture Polish are giving to all the nail polish bloggers out there. When you think about it, the last year or two as certainly been a nail polish blogging revolution. I'm going to start by talking about revolution, because I don't have any photos of it as a polish on it's own. Revolution is a new glitter base coat. It is water based but it is nothing like PVA/Elmers Glue or peel off base coats. 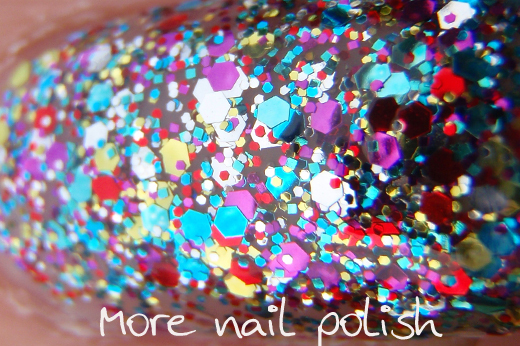 This is not a peel off base coat, but it is designed to make removing glitter polish easier. Since I discovered PVA, I pretty much use it all the time when I wear any glitter polish, If I don't, I will always use the foil method to soak off the glitter. Using revolution means you don't have to use the foil method and you can rub off your polish in a quicker time that you normally could. I found that once the polish remover broke the glitter seal of the glitter polish and got to the base coat, it rubbed off quite well. The second thing about revolution is, and this is something I kinda leaked a bit early, is that it is an amazing top coat for nail foils. It truly is the first and only polish I have discovered that does not wrinkle foils. I've got another foil design to show you tomorrow night, but check back on these posts (Easter foils, Green foils and Jade and Gold) to see the perfectly smooth finish on foils that lasts for days! Now onto Blogger. 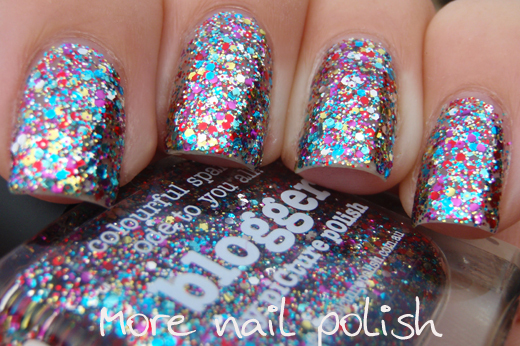 As you can see, blogger is a glitter polish that is totally jam packed full of medium and small glitters. 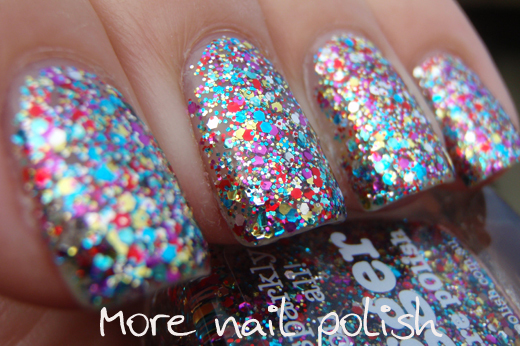 There are red, fuchsia, silver, yellow teal blue and sky blue glitters in two sizes. A word of warning that this polish is uber thick. I added some thinner to mine after painting my first three fingers cause I just found it a bit to hard to work with. After the thinner is was fine. This was two coats of blogger, and while there are some small empty gaps on the side of my nail, two coats without any undies was all I needed. I did end up putting three layers of top coat, because I love that glassy polish finish over a crazy glitter. When applying this polish I dabbed the first coat it on and then wiped the second coat on like normal. Here is a quick video I created last year about how I dab on a layer of polish. I also believe that today is a big day for Picture Polish on the Gold Coast in Queensland, Australia. Today they officially open their Head Quarters. Jules send me this sneak peak of what she has called 'Cathy's Corner" Holy Crap people. Seriously. 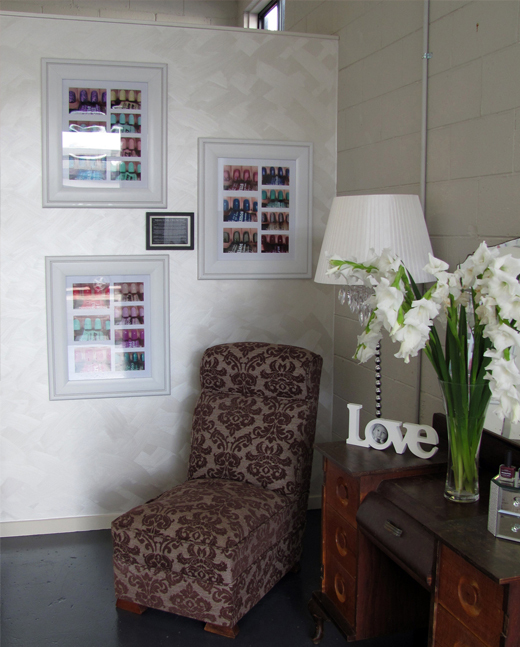 Look at the photos on the walls. My fingers are framed!! I think the word on the desk in the photo sums up my feelings about this! That little plaque on the wall is a bio about me that I was asked to write - I'll put the text below for those of you that will never get to the Picture Polish HQ to see it - although I'm telling you, I'm definitely going to visit the HQ next time I'm up in Qld. My name is Cathy and I write the blog MoreNailPolish.com. I’m a thirty-something mum of two, who works full time in the IT industry and I like nail polish. A lot! I’ve been ‘in to’ nail polish for as long as I can remember. For a very long time I just had a large makeup case that contained all my polishes (around 30 of them). I distinctly remember buying my first Ozotic nail polishes in around 1999 or 2000. They were a silver holo and a multichrome, I had never seen anything like them and I have been completely hooked on nail polish since then. Around December 2009 I happened to finish a bottle of my favourite nail polish. Up until that time I had always purchased my nail polish through regular shops, but this time I wasn’t able to find a bottle anywhere. I jumped on-line and started googling and came across a handful of excellent blogs. After reading those blogs, my polish collection grew instantly in just a few months from 30 to about 200 polishes and I soon realised that I wanted to document my polish experiences. By starting a blog I was able to share my fun with family and friends as well as justify to myself, the crazy need to buy more polishes. Now my polish collection has reached an obscene number, and just about everyone I know wonders why I need umpteen versions of the same colour. The truth is, even in a collection as big as mine, I don’t consider any of my polishes duplicates of each other. I can see the subtle differences in every single one. In fact a party trick I like to do is compliment the nail polish a complete stranger is wearing, and then comment on the brand and polish name. I paint my nails nearly every day, not because I need to, but because I want to. I love the different finishes and effects that can be achieved so quickly with nail polish. I usually spend about 15 minutes doing a simple manicure, but have been known to spend more than and hour working on some fancy nail art. I love how accessible nail polish is. It can be worn and appreciated by anyone and I truly believe that nail polish has no age limit. I love that my mid 60’s mum can rock a glitter bomb manicure! It’s such a simple way for people to express their mood or style and you can completely change that look in such a short time frame. The highlight of my blogging career would undoubtedly be the release of my Picture Polish Collaboration Shade – Kryptonite. I’ve received so much positive feedback from women all around the world that have purchased the shade and loved it. Anyway, what do you think of blogger? Are you over glitter bombs because of the onslaught of indie brands, or is there no such thing as too much glitter? I really quite love this polish and while I have alot of polishes that are made up with medium and small multicoloured glitters, none have this colour combination and appearance on the nail - at least in my collection. Picture Polish nail polishes are available from Picture Polish directly or through their vast network on resellers around the globe. Woo Hoo!!! Way to go!!! How totally awesome - on everything!! 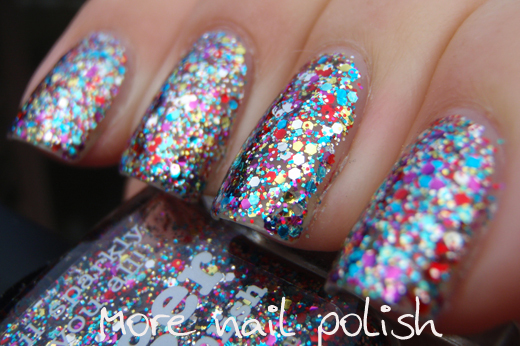 What a gorgeous glitter polish! I've been waiting for you to release the name of the topcoat for foils since you first mentioned it. 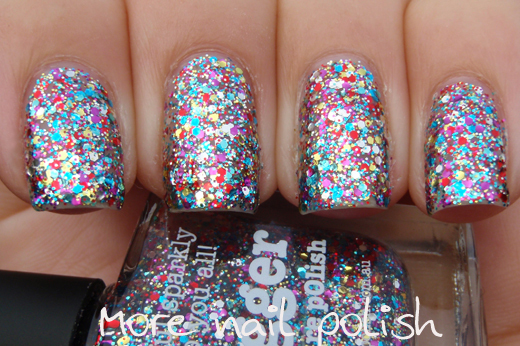 I've already jumped on the Picture Polish website and placed an order! They both look awesome! Def a brand I'd love to try! Love your framed pretty polished fingers and bio Cathy! You've inspired me to start my blog to justify my addiction ;) ! Congrats to Jules and Picture Polish, Bravo to all the new collaboration shades and cant wait to try them and Revolution! I will definitely get a bottle of Revolution as soon as I can! I really enjoyed reading your bio - you must be so proud of 'Cathy's Corner'! And of course I think the 'blogger' polish is awesome! Congratulations on Cathy's Corner! I read your blog everyday, and I think your pictures and commentary are spot on, thank you for bringing some of the best glitter bomb pics out there! You inspire me to wear more glitter! Anyways, I love Blogger, yes I have upteen types of similar glitter, but I got it anyways, as a tribute for all the bloggers out there. Keep up the good work! You totally deserve this Cathy's Corner! I don't comment often, but I love your blog very much. For a girl from Russia your blog is the best source of information about Ozotics and Picture Polish (those color guides! you are my hero for creating them!). And I love Kryptonite madly. Seriously. I have about 70 different greens, but Kryptonite is one of the prettiest. "In fact a party trick I like to do is compliment the nail polish a complete stranger is wearing, and then comment on the brand and polish name." -- i love doing this too!